I am a…modest crocheter, by which I mean I have a general grasp of the basic stitches and can crochet an edging onto a lace shawl with no stress. But I haven’t really delved much into that side of yarn crafting, beyond the single and double stitch. 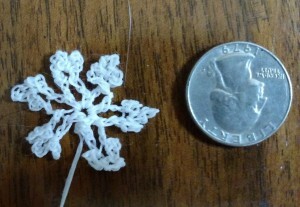 So what better way to do it than with crochet cotton (size 30, in case you are wondering and I am sure you are), a 1.9 mm needle, and a book of snowflake patterns? Here is my first one. Quarter is included for scale. It is slightly damp because that’s the only way I could get all the little points to lie flat. Now that I look at the picture, I notice one of the little points is folded over, but eh, I’ll fix that when I block them all with stiffener at the end of the month. I am not the only one doing a daily challenge this year – as we’re now in charge of the Holidailies site, I had a neat idea of setting up an additional monthly thing called Thingadailies. So check out the page (it’s the same link) to see what other people are making daily during the month of February. Our house was at one point split into two flats – an upper and a lower – which I suppose is the reason for why there is a set of double doors in what is now the master bedroom. They’re annoying doors because they have glass inserts, although the previous owner covered those with wooden shutters….from which we ended up removing one slat to save our sanity due to a certain grey tabby (Rupert) pawing repeatedly at them when he was younger so that he could look outside (the fact that he could have nearly the SAME VIEW from the window not five feet away was irrelevant). Because the lower level is about 2 feet below ground, there’s a step down immediately after you come through those doors, which means there’s really nothing to hold the doors in place except a cleverly placed pin in the floor. At some point – who the heck knows when – one of us must have opened the doors for some reason or another and pulled up the pin, and then never bothered to put it back. Not a big deal except that last night there were crazy winds…which is to say that when I came downstairs to go to bed, I heard a weird roaring sound and realized that what I was hearing was the wind through the OPEN DOORS. My first thought was someone had broken in. My second thought was sheer panic that Sherman had taken this opportunity to escape. I screamed for Richard, and then shockingly saw Sherman *inside* the house (either he’d already been out and come back, or he’d not yet discovered the clear avenue to the Great Outdoors). I shut the doors, we hastily did a head count (all cats accounted for, phew), and that is when I discovered that the locking pin had never been deployed. That has been fixed and large furniture has been moved in front of the doors because now we’re both on the paranoid side, and we’ll be working out a more visible method of ensuring this never happens again. Gah. Ah, another idea for a “thing”! I haven’t crocheted in a million years, but hey. Thanks for doing this!